For those wishing to take color skills to the ultimate level, here are the two dates for Applied Color Theory classes in 2018. • ATLANTA, Wednesday, May 16, through Saturday, May 19. • SAN DIEGO, Wednesday, August 22, through Saturday, August 25. 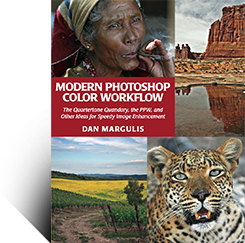 These classes—four long days, limited to eight persons—have changed the lives of many a photographer, many a retoucher, and many a Photoshop authority. This will be the 24th year I’ve been teaching them, in a dozen different countries, in four different languages. And never the same way twice. Every group has its own character, faces its own challenge, exults in its own successes. I never got tired of it, because I never found it repetitious. Of course, the class has changed drastically over time, adding new techniques and interesting imaging problems. In 2011 we switched from three to four days, in view of the increased complexity in our field. But the format is the same. I teach what I can, then the group works independently on a set of images, and then the results are compared. This routine is repeated seven more times over the three days. By the time the class is over, we’ll have compared our results on 28 different images. The first 12 are the ones that every class works on. The last 16 are customized to and chosen by the class. Often they include images that class members themselves have provided as representative of their own work. This year, we’ll be adding some of the images from the MIT set that I’ve been writing about in this blog. All of us who are serious about the topic have developed our own methods which seem to work well for us. Unfortunately, we normally have nothing to compare the results to. Many methods, some quite crude, still can make original photographs look a lot better. The question always is, how much better could it have been? Nothing can answer that question better than seeing what others can do with them. In principle, you ought to be able to get what you think is the best result, because nobody else can read your mind to know what you’d like to do with the picture. In practice, especially during the first two days, there is a lot of wailing and gnashing of teeth from students whose work did not measure up to their own expectations, in comparison to that of others. Four days, 40 hours. It remains the fastest way that a professional—or someone who wishes to produce professional quality work—can upgrade color correction skills. If you’d like more information, or to consider signing up, here’s the link.